Ron Raze of Pipersville in Bucks County rallied to launch the Green Justice Philly Coalition, Wednesday, October 14, 2015 at the Municipal Services Building in Center City. 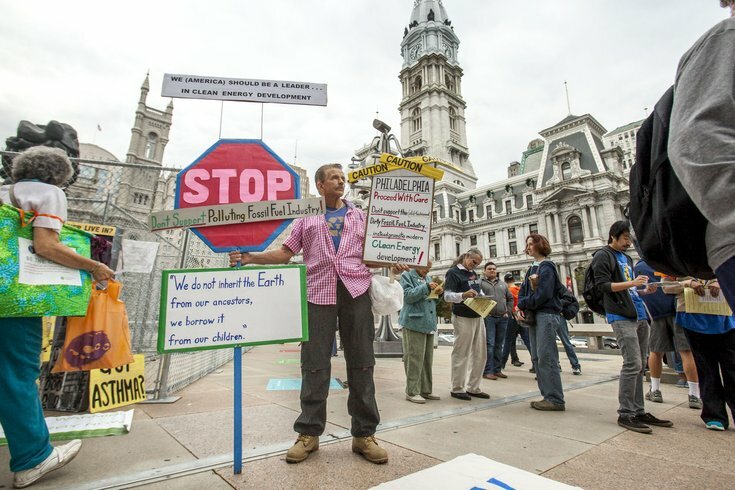 With a rallying cry of "no pollution," representatives from several environmental associations on Wednesday announced a new "Green Justice Philly" coalition intended to promote green jobs and sustainable energy in the city. During an afternoon rally that drew a large group to the plaza outside the city's Municipal Services Building, organizers argued that the city needs to work on combatting air pollution and renewable energy. Notably, speakers throughout the afternoon event pointed to Philadelphia Energy Solutions, the largest oil refinery on the East Coast, and a proposed "Philadelphia Energy Hub" – a plan announced in April to bring Marcellus Shale gas into the city before piping it to other cities – as projects that would work against Mayor Michael Nutter's stated goal of making Philadelphia the greenest city in America. Tracy Carluccio, deputy director of the Delaware Riverkeeper Network, called the energy hub plan "dirty." Instead of focusing on creating jobs in that energy hub, the city should be trying to create jobs in renewable energy sources, she said. "We want the city to open up a path to clean and renewable and sustainable energy economies," she said. Instead of focusing on fossil fuels, she said the city should look at investing in clean energy, such as solar and wind power. "It's a dead end if we pursue fossil fuels," she said. "We need to develop an alternative plan." Ron Raze, a life-long environmentalist from Pipersville, Bucks County, agreed. "We have to change. We can't continue on the way we are," he said. The new "Green Justice Philly" coalition includes representatives from the Delaware Riverkeeper Network, ACTION United, the Clean Air Council, Clean Water Action, Food and Water Watch, the Maypop Collective for Economic and Climate Justice and the Philadelphia Chapter of Pennsylvania Interfaith Power and Light, as well as at least 20 membership organizations. During the rally, Walter Tsou, who served as health commissioner for the City of Philadelphia from 2000 to 2002, told the crowd that investment in fossil fuel technologies would only "make this situation that much worse." "Air pollution is going to be the number one health threat facing the world," said Tsou. "Let's use the money that's out there and invest in renewable energy." An investment in renewable energy is something the city, and indeed, the entire state of Pennsylvania sorely needs, said Micah Gold-Markel, a Northern Liberties resident and founder of Solar States, a solar power installation and education company. "We've lost jobs instead of gained jobs because of our dependence on dirty, instead of clean, energy," said Gold-Markel. In fact, the focus on Marcellus Shale gas has reduced the number of jobs at clean energy companies throughout the state from about 4,000 in 2008 to only about 500 this year. The first order of business for the new Green Justice Philly coalition, Carlucci said, will be to deliver a letter to City Council to seek its cooperation in supporting renewable energy and green job creation in Philadelphia. "I'm going to deliver it myself," she said.